Considered to be one daring and stunning style statement, freestanding bathtubs are becoming more popular in homes with time. No need for you to skirt the edges of your room to make it complement the bathtub decor. These baths are versatile, and wherever they are installed, they will prove to be the focal point of that space. Modern-day freestanding baths are not just a practical solution. They also double up as an incredible style statement presenting your bathroom an undeniable wow factor. If you are willing to install a freestanding bath, then here are some aspects to check out before ordering. When choosing the right size; you have to figure out where to instal it. You should look to place it somewhere in the centre of the room, leaving enough room to maneuvre around it. If you have a commodious bathroom, then freestanding baths are perfect to enjoy a spa-like treatment at home. However, that doesn’t mean that you cannot think of installing one in your small bathrooms. At Direct Tile and Bath,we offer freestanding baths or all shapes and designs. From classic 1800mm classic oval shaped bathtubs to a 1500mm simplistic bath for bathrooms where spaces are at a minimum; we have all your needs covered. Determining the size is the first thing to do. With that; you also need to inspect that the floor joists are enough to bear the weight of the bath. If you need any assistance, let us know! As visual aesthetics are crucial; you should also consider the drainage configuration and the plumbing before installing one. Functionality and placement of the freestanding bath should also be considered. The placement ought to be such that you can easily slide in and out without much of an effort. In terms of style; you will come across a wide range of freestanding baths in Perth, right at our website. 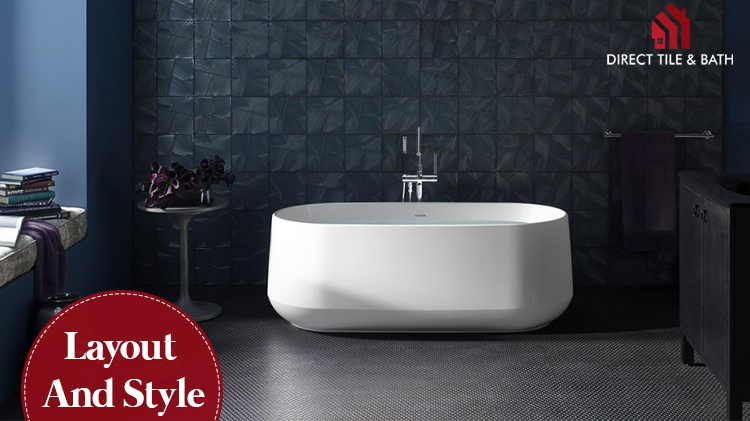 Whether you want a contemporary look or want to install a tub with timeless class; all you need to do is choose. If you wish to expense a bit more, then you can opt for tubs with clawed feet. They will serve as the centrepiece of your bathroom. Furthermore, all our freestanding baths consist of a built-in pop waste plug along with a flexible water hose. All this means that once unboxed; it is ready for use. Contrarily, if you want to create a striking presence with a minimalistic bathtub, then; you can opt for our splendid natural sheen Acrylic freestanding baths. Creating the first impression always matters, and with freestanding baths from Direct Bath and Tile; you can do that. You can go for lightweight, warmth and durable acrylic freestanding baths which comprise a double insulation layer coupled with stylish designs. However; you can also opt for freestanding baths engineered with cast iron and stone designs to create a show-stopping feature. But; you need to remember that they are way heavier. One great thing for you is that new and trending stocks keep arriving, giving you plenty of fresh options to check whenever you visit. So, if you wish to instal quality acrylic freestanding baths in Perth and want some help in sorting out the right option; speak to our experts. They will be more than glad to help you out.